Bottle Rocket (1996) saw the auspicious debut of a uniquely talented filmmaker with his own distinctive cinematic worldview. Wes Anderson made a very personal film with several of his friends starring in it, most notably brothers Luke and Owen Wilson, who would go on to have very successful careers of their own. Owen co-wrote Bottle Rocket with Anderson and it is really their shared vision. They would collaborate on several other films, most significantly Rushmore (1998), The Royal Tenenbaums (2001) and others, but Bottle Rocket is where it all began. Dignan (Owen Wilson) helps his friend Anthony (Luke Wilson) “escape” from a mental hospital (he doesn’t know that his friend was there voluntarily) and once they are on the road, Dignan reveals his 75 year plan for them. Part of it involves becoming criminals and they practice by robbing Anthony’s house before upgrading to a local chain bookstore with the help of their friend Bob (Musgrave), who seems to have been included only because he has access to a car. It becomes readily apparent that these guys are pretty lousy criminals. They may be adults but they still have a lot of growing up to do. Anthony’s kid sister, Grace, seems to realize this when she asks her brother, “What’s going to happen to you, Anthony?” She comes across as wise beyond her years, like one of the Glass children in a J.D. Salinger short story. However, in Anthony’s case, he is looking for purpose in his life as he says at one point, “One morning over at Elizabeth’s beach house she asked me if I’d rather go water skiing or lay out and I realized that not only did I not want to answer that question but I never wanted to answer another water sports question or see any of these people again for the rest of my life.” He and Dignan come from privileged homes and are clearly rebelling against the boring lives they lead. They are looking for something else, which Anthony will only realize later on when he meets Inez (Cavazos). Anderson does a great job of conveying what good friends Anthony and Dignan are early on by the way they banter back and forth, often talking over each other and easily getting on each other’s nerves as only close friends can. Anderson often plays this for laughs like in the scene where Anthony, Bob and Dignan go over their plans for the bookstore heist. Bob is playing with a handgun which annoys Dignan to the point where he dissolves their gang until Anthony acts as peacemaker. Their criminal ineptitude is also played for laughs when they rob the bookstore. These little jobs are Dignan’s attempts to impress Mr. Henry (Caan), the local criminal mastermind who proceeds to show them how a real crook operates. Owen Wilson plays the first of what would become the prototypical Anderson protagonist: irrepressible dreamers with immature streaks. One can see these qualities in Max in Rushmore and Royal in The Royal Tenenbaums. Dignan is a deluded optimist and Wilson makes him charming despite the crappy things he does to his friends. 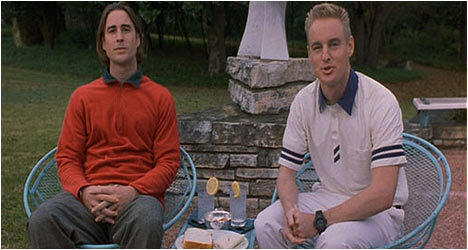 In contrast, Luke Wilson plays Anthony as the laidback realist who tries to keep Dignan grounded. A lot of the film’s humour comes from watching these two characters interacting with each other and watching the colourful supporting cast bouncing off of them. Bottle Rocket is an excellent reminder of what an exciting decade the 1990s were for American cinema with the likes of David Fincher, Paul Thomas Anderson, Spike Jonze, David O. Russell, and, of course, Wes Anderson emerging with fresh and exciting films that were all welcome relief from the safe, formulaic studio movies produced by Hollywood at this time. Ever since Wes Anderson has been releasing special editions of his films through the Criterion Collection, fans have been hoping that Bottle Rocket would get deluxe treatment. The wait is finally over. Disc one starts things off with an audio commentary by director/co-writer Wes Anderson and actor/co-writer Owen Wilson. They touch upon which scenes from the original short film survived into the feature. They also point out the re-shoots done after a disastrous test screening. Anderson and Wilson talk about how producer James L. Brooks helped them get Bottle Rocket made and taught them about screenwriting. It’s great to hear these two long-time friends talk about their first film. On disc two there is “The Making of Bottle Rocket,” a 25-minute retrospective featurette that brings back key cast and crew members as they reflect on how the film came together and what they think of it now. There is footage from the short film and outtakes from the feature film. One gets the impression that James L. Brooks really mentored Wes Anderson and Owen Wilson. Mainly, it is just great to see everyone from Luke Wilson to Kumar Pallana reminiscing about making this film. “Storyboards” is a collection of Anderson’s original sketches for specific shots and scenes in the film. “The Bottle Rocket Short” was shot in 1992 with only $4,000 on 16mm black and white film stock. Running only 13 minutes, it was shown at the Sundance Film Festival in 1993. Crappy copies have circulated on the Internet for some time and now fans can throw them away as this copy looks great. One can see the core ingredients of what would become feature film. Also included are a collection of deleted scenes that include the source of Future Man’s name but mostly there are several scenes between Anthony, Bob and Dignan. There are some really entertaining and funny bits but one can see why this stuff was cut. “Murita Cycles” features friend and collaborator of Wes Anderson and the Wilson family, Barry Braverman and a short documentary that he made about his father, a Staten Island bicycle shop owner that inspired the Bottle Rocket short film. “The Shafrazi Lectures, No.1: Bottle Rocket” is a rather odd featurette with a guy reviewing the film. He compares it to films from the 1950s and talks about his favourite scenes. “Anamorphic Test,” Originally, Anderson planned to shoot the film in the widescreen Panavision format and shot a test scene that actually looks really good. It’s too bad that they didn’t go that way. Finally, there is a collection of photographs by Laura Wilson, the Wilson brothers’ mother. We see Anderson and the Wilsons planning the short film in 1992. There are shots of them at Sundance and also lots of great behind-the-scenes snap shots of them making the feature film.